We love you. We do. We love your sense of humor and your ability to be creative so quickly. Your wittiness and hilarious reactions to things that happen in our world. We're even able to forgive you for all those time our hashtags never really caught on, it's cool we're over it. However, we've come to a point where we need to ask for a favor. 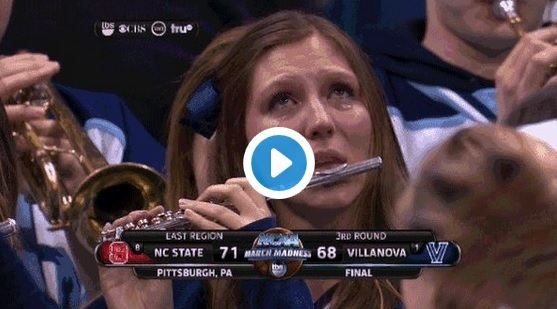 Can we all agree to retire the Villanova crying piccolo girl? Roxie Chalifoux has been through enough and after last night's win in Houston, in which Roxie was in attendance, we should never see a meme of her again. Not because she and it are not awesome, but because it has run it's course. There may never be a better March Madness band meme ever again which is why we should let it enter the meme hall of fame and stay there...forever. Let's learn from Brett Favre's mistakes and let this go out when it should. Let's talk about it like we do Paul Bunyan or the Yeti Monster. A larger than life tale of a heroic band member whom over night became a world-wide sensation and gripped the nation with her tears. Tell the story to your children before they go to bed. The tournament didn't decide this matchup. Let's end on that and let Roxie return to being another young professional who also happens to have a personalized bobble head. She deserves it.